While many people consider braces to be a teenage rite of passage, early intervention innovations like two-phase orthodontics are promising young patients fewer extractions and better oral health. This February is National Children’s Dental Health Month and we’re urging parents to rethink braces. By bringing your child to an orthodontist before all of their permanent teeth have erupted, you can set their smile up to be healthier and happier through proactive treatment. Most professionals recommend that patients see an orthodontist when they are as young as 7 years old. This proactive visit can be incredibly beneficial for your child’s overall health. By evaluating your child’s teeth, jaw, and mouth, your orthodontist will be able to anticipate future orthodontic issues, and if necessary, treat them in a two-phase process. 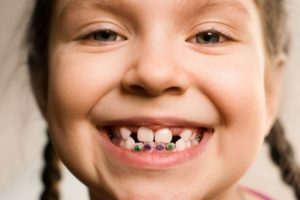 Because many parents underwent one prolonged orthodontic treatment in their own youth, using more than one phase for their child’s treatment may seem unnecessary. With two distinct treatment phases and a rest period in between, orthodontists use early intervention during Phase I to tackle jaw, palette, or other mouth problems, correcting them before they might develop into a serious issue. After Phase I is complete, patients are given a rest period as their permanent teeth finish erupting. Patients then begin Phase II, which is the final stage of fine tuning that creates a perfectly aligned, healthy smile. Fewer extractions of permanent teeth. All teeth serve a vital purpose in the mouth, operating as tools for digestion, chewing, and speaking. Early intervention helps the mouth accommodate adult teeth, eliminating the need for multiple extractions or oral trauma. Healthier permanent teeth. When permanent teeth are crowded or misaligned, it can be substantially more difficult for patients to remove plaque by brushing and flossing, and substantially easier to grind teeth or wear them down. Simplified Phase II orthodontics. Early intervention eliminates the need for many invasive or painful treatments later on, making Phase II a more streamlined process. Early intervention through a two-phase orthodontic program can save children from needing more intense and invasive treatment in their teens and can correct a number of issues that sometimes interfere with oral health. If you are interested in learning more about early intervention or want to know if your child is a good candidate for a two-phase orthodontics plan, call us today to schedule an appointment. Our friendly staff is happy to answer any questions you may have and can’t wait to help you make your child’s smile as healthy and happy as possible.